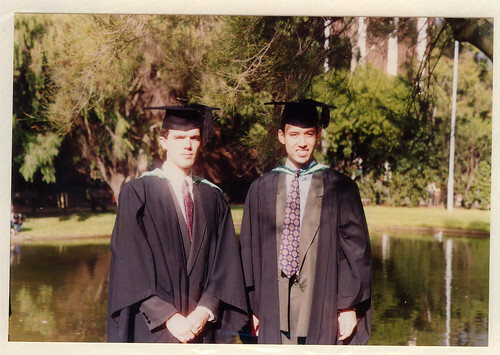 My old uni buddy Brian recently emailed through a copy of a photo from graduation day at Monash Uni, from 1993. It was at the main Clayton campus, which we rarely actually went to in our student days, though I do recall one memorable session in the campus radio station recording a demo tape of us being comedy DJs with Nick Marvin (then student newspaper editor, now CEO of the Perth Wildcats NBL team) which, to my knowledge, never got broadcast. Brian and I started uni in 1989. Our degree — Bachelor of Computing (Information Systems) — at Caulfield campus was meant to be three years, but Brian did Honours, and I… uhh… well, I failed a core subject in second year, and thus was a year late finishing. But I got to do some extra electives as a result which taught me some really good stuff I’ve since used in my IT career. 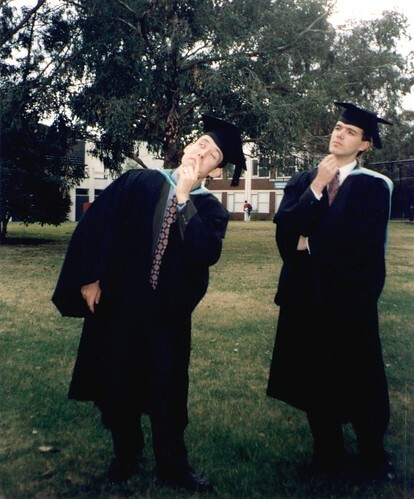 So we both finished in 1992, and by the time graduation day rolled around, we were colleagues, fresh-faced graduates in a small team somewhere inside the machine of corporate Australia, and travelled down to Clayton for the day to put on the gowns and silly hats and get our degrees. Being the serious young men that we were, in the learned grounds of the campus, we took a few minutes to thoughtfully ponder what the future might hold. I wonder how many graduates are still working in the same field almost 20 years after they left uni? Well done, Daniel. PS I went to Monash and got a “Clayton’s” degree (if you get the old joke) – You got a Caulfield one. Those photos have very very handsome blokes. You are the most handsome bloke in the photo. You look very young and very familiar. And do you still know each other? What did you used to do with eachother? Did you find yourself as a Caulfield student, doing most of your exams at Clayton? It was the opposite for me- sat more exams at Caulfield Racecourse than anywhere else! Hey, at least you got photos! My dad forgot to put film in the friggin’ camera (it was 1989 so I’m a bit more ancient than you) and this was after he, my grandfather and I, each representing the first of our generations to graduate from the same uni, posed for hours. @Phillip, yes, we still know each other, though he lives in the USA now. @Andrew V, no, we had some exams in the various halls around Caulfield campus, or in the racecourse buildings. I don’t recall any at Clayton; it was very rare that I went down there, in fact. @Kath, LOL, sorry, but that’s pretty funny! Nice comments, thanks everyone :) Daniel and I met in first year; its interesting how similar people will just gravitate towards each other. Our group of about a dozen guys hung out together most of the time, quoted Monty Python, marvelled at Usenet and IRC and other nerdly college activities. I’ve lived in the USA for about 10 years now, about to get married again, and will be visiting Oz June/July with my new fiancee, who really, REALLY wants a picture holding a koala! Are there places that allow that? enno – they sure were! First year Engineering subject called ‘Engineering Computing, Capt’n Snooze (Dr. Suter) said he didn’t want us to become Pascal programmers per-se, ad nauseum. Crapped on about algorithms forever and sent us to sleep!! By the way, if you’re wondering why we used to call our lecturer Capt’n Snooze, it wasn’t due to boring people- he looked like Capt’n Snooze! Pascal was specifically designed to encourage good programming, so it’s not surprising it’s used in education (I learnt it in year 11/12).